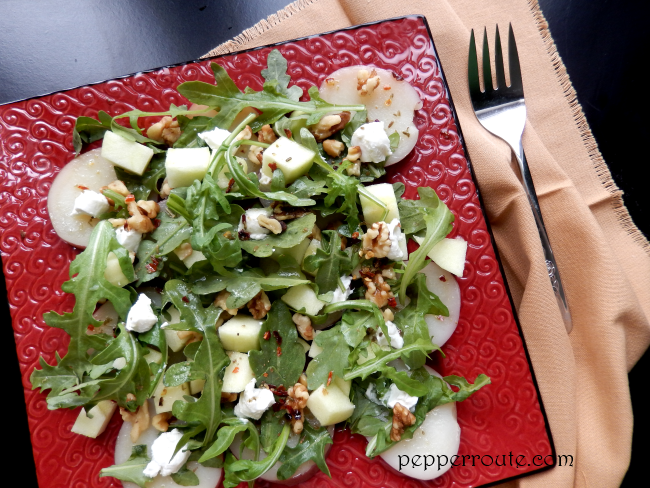 The name says it all… potato, green apple, arugula, goat cheese… what more could you ask for, in a salad? 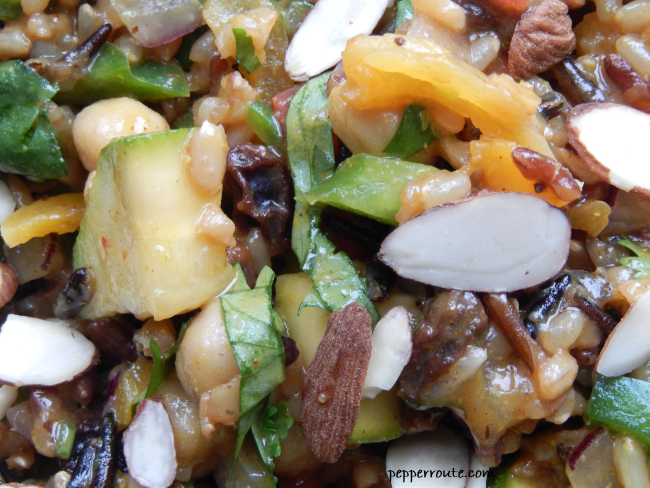 But there is still more… roasted walnuts and a tangy, spicy dressing to top it all! 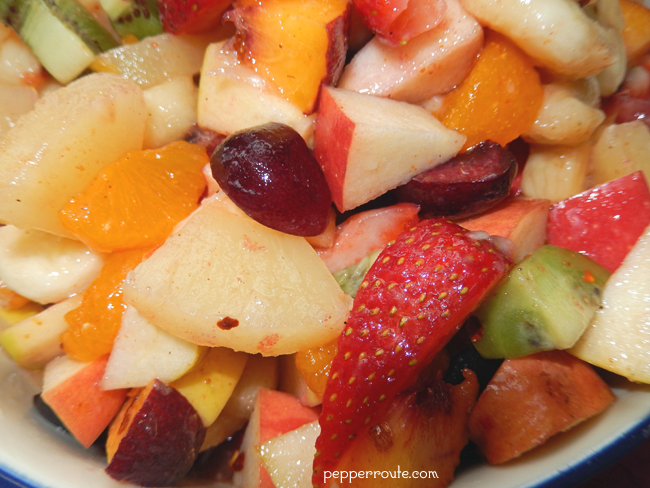 Honestly, this is one of the easiest and tastiest of salads that I have ever made or eaten! 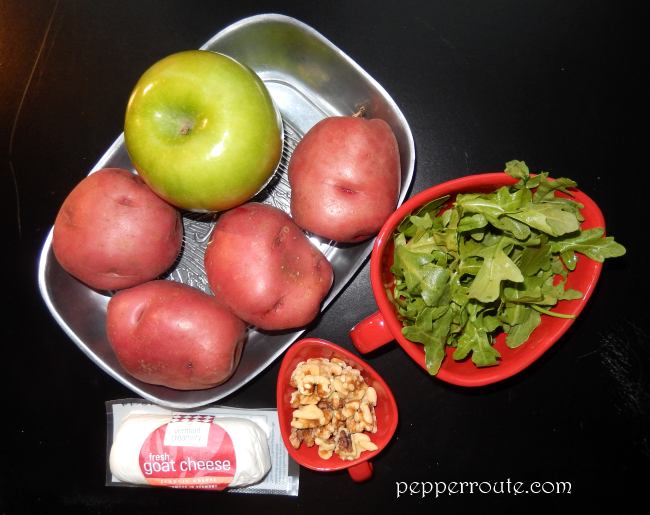 Though any variety of potatoes can be used in this salad, red potatoes have proved to be the best choice. Also, crispy, tangy granny smith apples go very well with the red potatoes. Arugula is my favourite salad leaf. Not ‘one of’, but ‘the’! 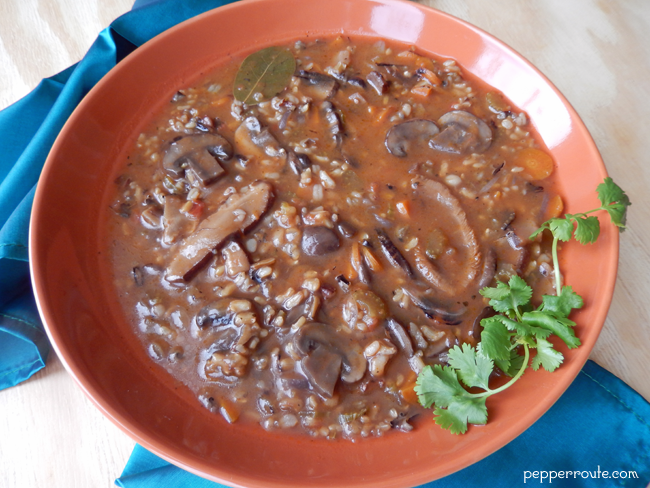 Sometimes I keep some in a dish and keep munching on the leaves as I go about my cooking. This lovely green with a peppery flavour is full of phytochemicals, anti-oxidants, vitamins, and minerals! 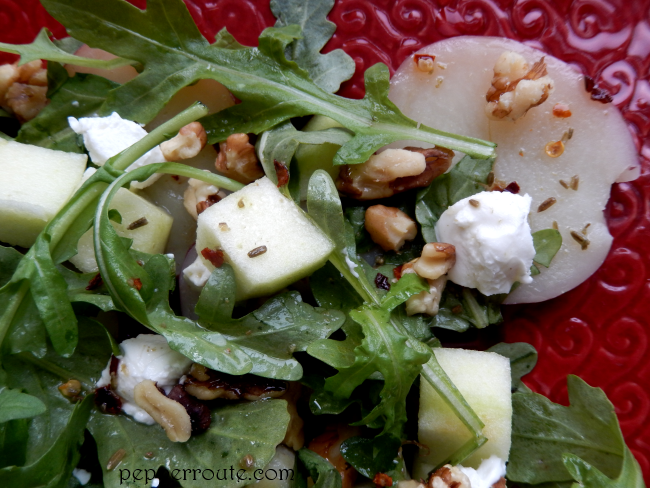 Goat cheese is the perfect counterfoil for the sharpness of arugula. Add some walnut for crunch, and you got an absolute winner. A simple lemon juice and olive oil dressing with a tiny bit of honey is kicked up with crushed cumin and a tiny pinch of red chili flakes. Shake together the lot, and the fabulous dressing is ready in two minutes! 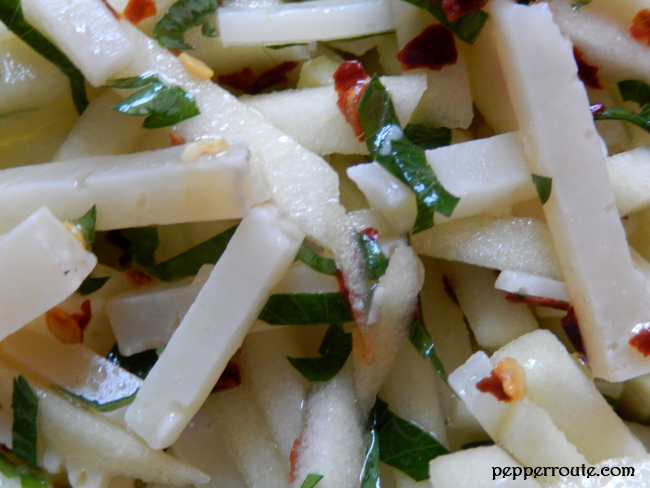 This salad is assembled layer by layer starting with the boiled potato slices. After placing each layer, add some of the dressing on top the layer and continue with the next layer. 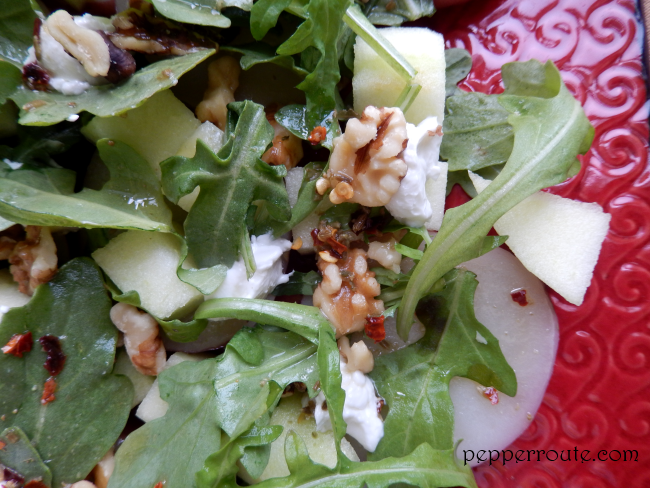 Potatoes, apple pieces, arugula, goat cheese, and walnuts at the top. And end with a drizzle of the remaining dressing. 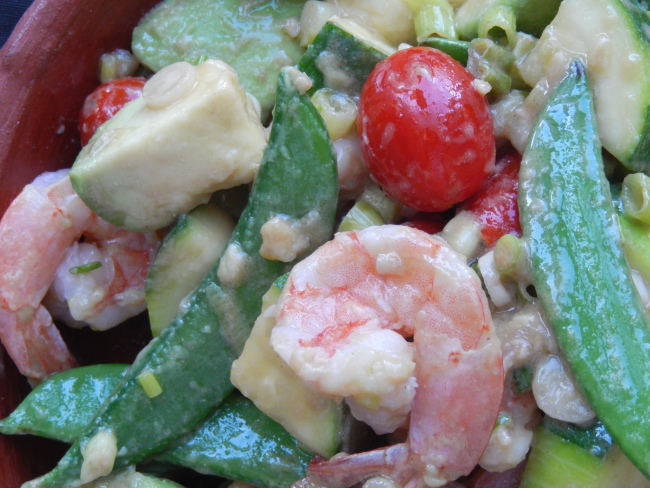 It’s not a good idea to keep this salad for long – in or out of the refrigerator. So you should keep all the ingredients ready – even make the dressing – and assemble it just before serving. Boil the potatoes in salted water, with the skin on and keep aside. Cut the apple into bite sized pieces. Dry roast the walnuts till they start to turn golden brown around the edges. Mix together the lemon juice, olive oil, and honey. 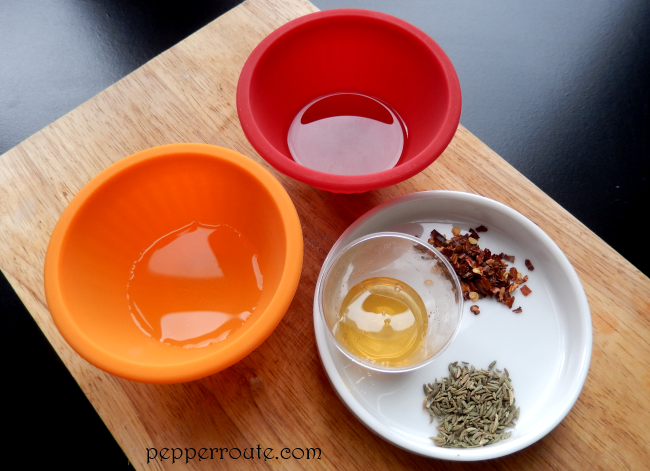 Crush the cumin coarsely and add to the dressing mix, along with the red chili flakes and mix thoroughly. 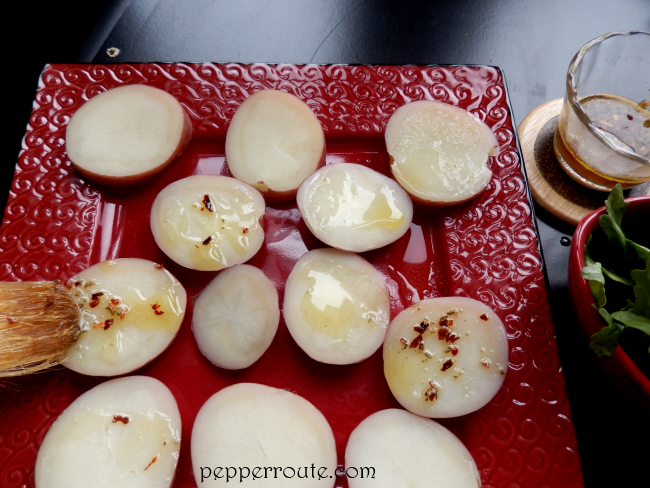 Slice the boiled potatoes thickly and place on a salad platter. Using a pastry brush, brush the dressing on the potato slices. 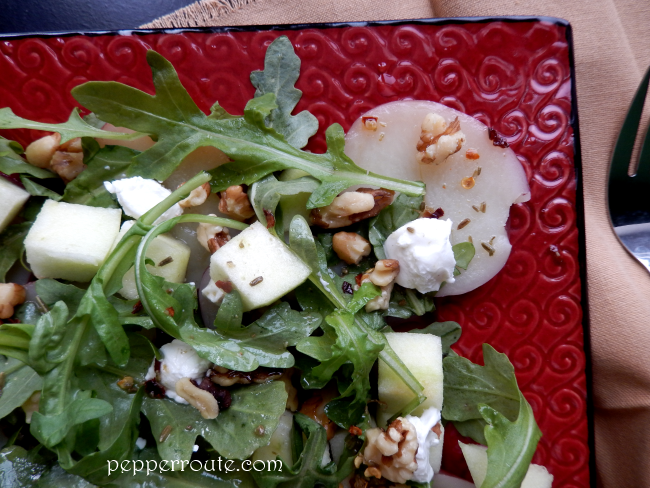 Add the apple pieces, arugula and goat cheese bits, adding some dressing after each layer. 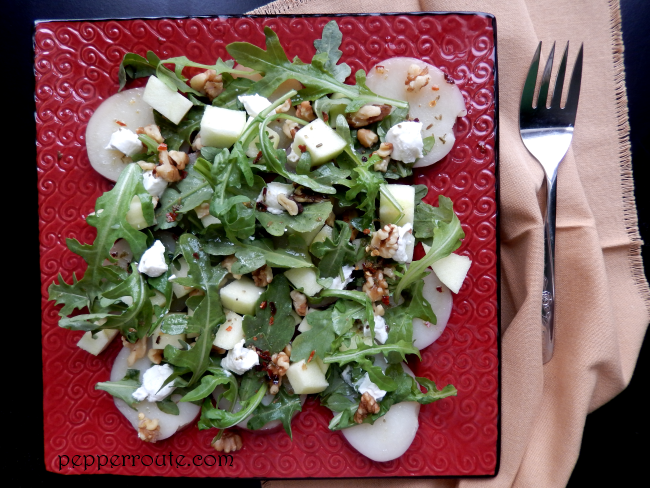 Toss the roasted walnuts on top and drizzle the remaining dressing over them. Serve the salad at room temperature. Yum!